That is a big question parents ask themselves. What did I do? I started reading, with all three children, literally from birth. It was something to do and they enjoyed being held and listening to my voice. I plan to do the same with my next child. I love what Jim Trelease says about this in The Read Aloud Handbook. He points out that when your child was born, you talked to your baby. You told him how much you loved him and gave him a list of promises. He didn’t speak your language yet, but you still talked to him. You spoke complex sentences. Trelease says, “If a child is old enough to talk to, she’s old enough to read to. It’s the same language” (page 23). 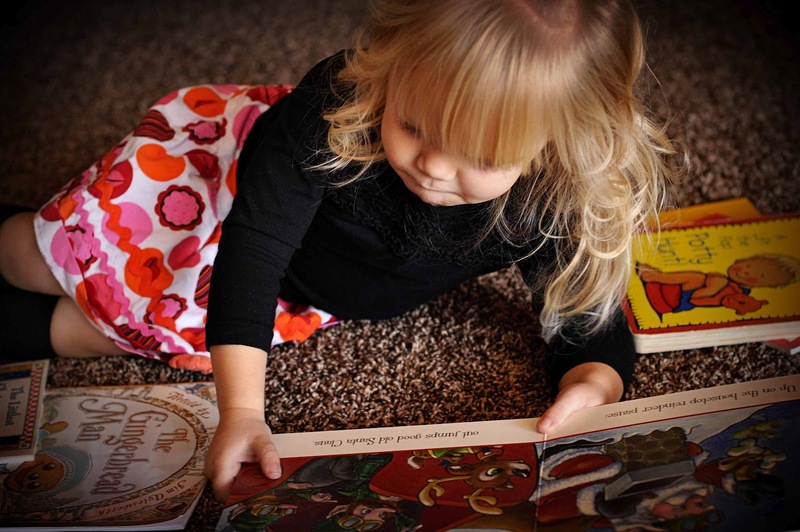 Whatever the age of your child now, don’t feel guilty if you haven’t started reading yet. Just start as soon as you can. Make the effort to start. Previous Post Poll Results: IF YOU BREASTFED, DID YOU FOLLOW THE BW RULE TO WAKE BABY EVERY 5 HOURS AT NIGHT UNTIL 5 WEEKS? When my daughter was 8 months old, I started taking her to "Baby Lap Time" at the library. It's a great outing. We also joined the reading program and maybe even win books. That's been really motivating for me to try and read with her 20 minutes a day. If your child is squirmy and not wanting to be on your lap, I suggest laying on the floor next to them and reading that way. My daughter LOVES this! I started to read to Isabella at birth.She loves books and to be read to. We read at home all the time, and for the last several months I've been taking my toddler (just turned 2) to Toddler Time at the library(songs, stories, action rhymes, and free play led by the children's librarian. Moms stay with the kids.). He asks every day if we're going to the library, and I think he may even have a crush on the librarian. Anyway, my baby (5 months now) used to sleep through the whole thing, but now he's started staying awake through it, so the last couple of times I've put him in his Bumbo in the circle with the other kids. He LOVES it! Smiles and listens and watches through the whole thing! As a teacher, and now stay at home mom to 7 month old twin boys, I wanted to instill the passion for reading that I have. We started a bed time routine (bath, feed, story, prayer) at 6 wks. My boys LOVE story time! We have moved story time to before naps as well. They know what to expect and love hearing my voice and will even giggle at the story (or my funny voice!). Thanks everyone for sharing your reading stories!